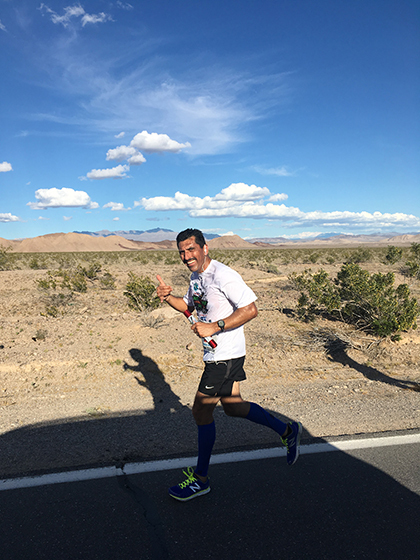 Probation Division Chief Alex Zermeno running his 4.2 mile leg of the 2017 Baker to Vegas Relay. Officers from Probation, Sheriff and the District Attorney’s office took off on a foot pursuit through the desert to compete in the 2017 Baker to Vegas Challenge Cup Relay. 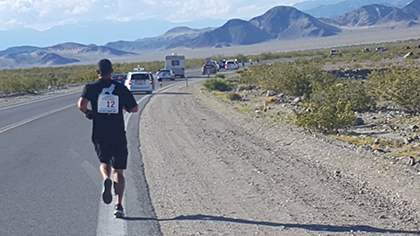 The 120-mile race, which starts north of Baker, Calif. and ends in Las Vegas, is a law enforcement challenge that includes teams from throughout the United States and other countries. The race was held the weekend of March 25-26 and is about endurance, teamwork and camaraderie. Runners each complete a segment in the race, even throughout the overnight hours. Competitors from Probation took first place with a 15-hour, 23-minute and 17-second finish in the Mixed Division, which means five members have to be women and all have to be sworn officers. Eighteen teams competed in that division. Overall, the Probation team finished 23rd of the 279 teams that competed in the race. This is the 19th time the Probation Department has competed in the race. Probation Team 24 had 20 runners, 4 alternates and 19 support staff. Among those were two members who either drove or took a flight into the area so that they could run their leg of the race and then immediately returned home. The Probation team took first place in the Mixed Division in the Baker to Vegas Relay. “It just shows how committed we are to making this race happen,” said recently retired Deputy Chief Probation Officer Dan DeLeon, who ran the last leg. In the past, the heat was often the most punishing part of the course, especially during the legs through the desert. But DeLeon, who has run the relay 17 times, said conditions were the best he had ever seen. He noted that this year it was cold at night. The highest temperature they ran in was 83 degrees when the race started at 4 p.m. and the coldest was 38 degrees in the middle of the night, he said. A Sheriff's team member on the road to Vegas.The Sheriff’s Department finished 10th in the Open Division with a time of 14 hours and 53 minutes. The open division includes all sworn personnel of any gender or age. The Sheriff’s Team 12 finished 15th overall out of all the teams. Deputies Steven Shepherd and Jennifer Albright at exchange point in the Baker to Vegas Relay. 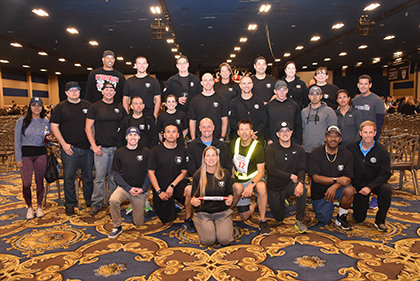 DA Baker to Vegas runners ready themselves for the race.The District Attorney’s Office fielded two teams that both made a competitive showing in the Mixed Invitational Category. Team 57 finished at 18 hours 28 minutes and 46 seconds, and the DA’s Bureau of Investigations Team 226 had a time of 18 hours, 58 minutes and 58 seconds. Of the 46 teams that ran in the division, Team 57 finished 31st and Team 226 finished 35th. The Mixed Invitational category means all but two members have to be sworn and five members have to be women. Overall, Team 57 finished 194th and Team 226 finished 213th of all the teams that competed. A DA team member on the challenging Baker to Vegas run.Team Capt. Chris Campbell said there were many last-minute challenges this year that meant they were still trying to put many of the runners, follow vehicle drivers and support team in place just days before the race. The DA team night shift on the Baker to Vegas Relay. Probation officer and team member Shawna Berke echoed this sense of gratitude for support staff. “None of this would be possible without the volunteers that go out with us. We cannot thank them enough,” she said. The Probation Baker to Vegas team with the support vehicles provided by Mercedes-Benz of Escondido and Marvin K. Brown Auto Center.